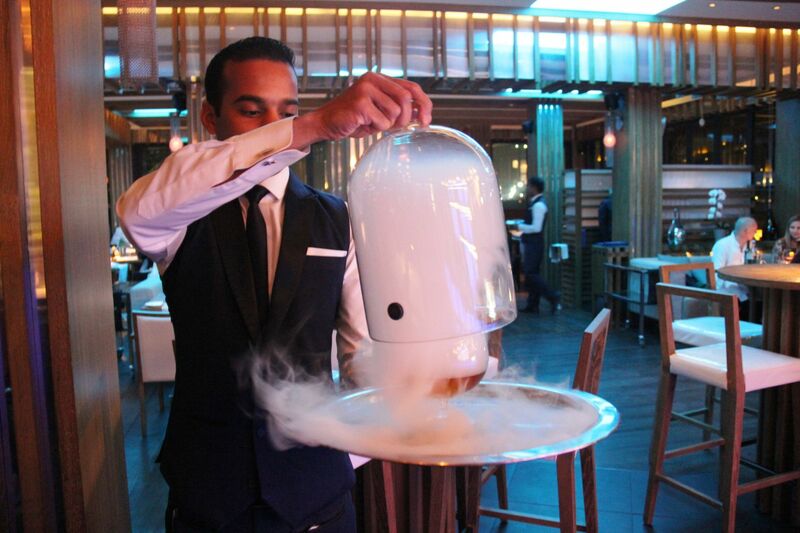 Well this was a first; a whiskey cocktail with real smoke pouring out of it. You can call it theatre, but I called it genius. It was a little number entitled “as good as it gets” the signature cocktail at Pier Chic, the celebrated seafood restaurant at Madinat Jumeirah set at the end of a pier jutting out into the warm waters of the Persian Gulf. Just us, the moonlight and The Burj for company. It was romantic for sure, but wait a minute, this was Dubai. There still are, it has to be said, many dissenting voices whenever I mention Dubai, but for me Dubai does what it does very well indeed. This is no Vegas faux, this is where luxury living shakes hands with authentic Arabian culture. 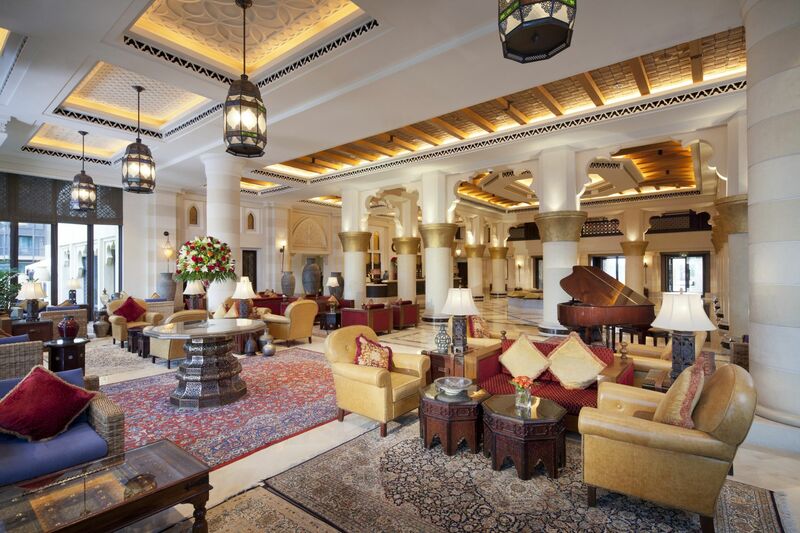 This is where the architecture is palatial but classy and in the main, proudly embracing its Arabic roots. And this is where the weather is guaranteed 50 shades of sunny from warm to hot depending on the time of year. Things are on the up here again with the 2020 World Expo looming. The new driverless metro system will whizz you around the city easily and cheaply as well as to and from the airport, although taxis are also a cheap mode of transport . Dubai may have had its genesis in the oil industry, but now oil is a mere 5% of Dubai’s income, because these days it’s tourism and property that fills the coffers. 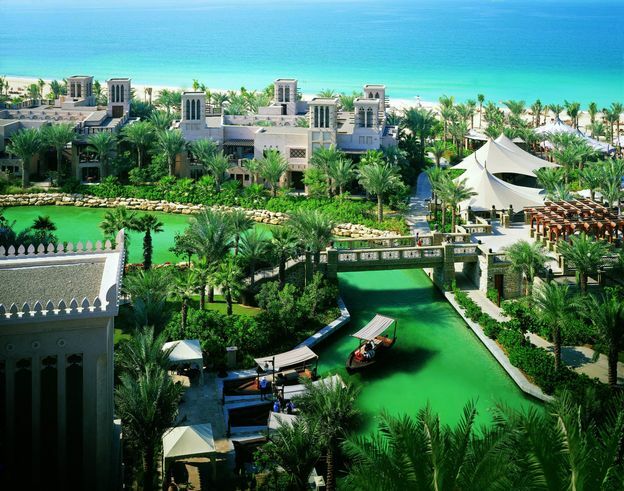 The Madinat Jumeirah is a perfect example. Set on Jumeirah, the very best part of Dubai, in front of over 2 kilometres of private beach, this is a huge complex comprising two 5 star hotels, clusters of traditional Arabic luxury summer houses, a myriad of restaurants, pools, a spa, a gym and even a souk, all scattered around a 3 kilometre network of Venetian-esque canals and landscaped gardens fringed with swaying palms and Bougainvillea. The genius of this for me is the pure theatre of taking a traditional Arab abra boat on a mini voyage through the complex of canals to your chosen destination on the complex, or simply just let it wander you through all of it on a round trip. Then perhaps a stroll along the tow path and discover little alcoves or hidden courtyards. 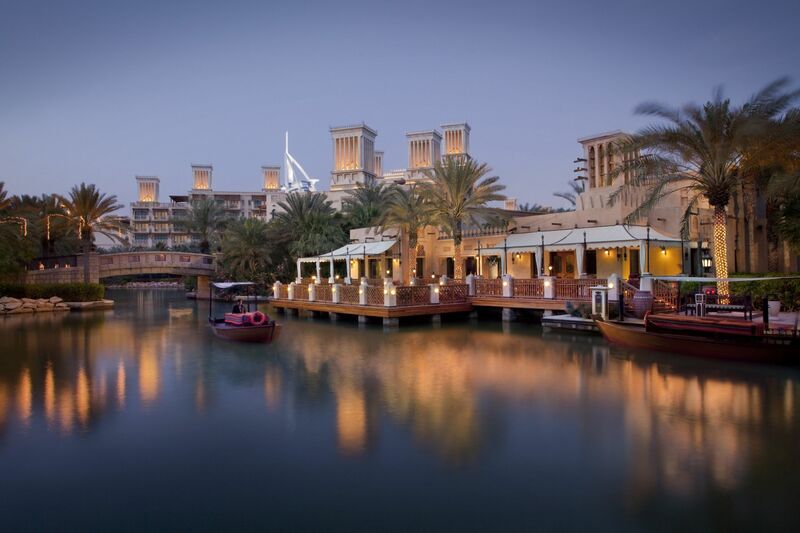 Of course if you like strolling and discovering, the Souk Madinat will let you do just that. A recreation of a traditional Arab souk it’s filled with restaurants and artisan cafes and shops and at its centre the Madinat theatre, always good for a show or two. At night the resort takes on a different look, the waterways and bridges romantically lit and the stunning Burj al Arab gleaming to one side. Of course, there are more restaurants and bars to choose from than grains of sand, and if you are on a half board package you can choose to eat at any of them; from Italian and Mexican to Moroccan or New York Steakhouse. The two stand outs for me though were Pier Chic for the fish and seafood, (and of course those delicious cocktails) and Pai Thai a multi award-winning Thai restaurant which offered stunning views across the Gulf. I was staying at the Mina A’ Salam hotel meaning ‘Harbour of Peace’ (which wasn’t far from the truth with the Madinat’s main boat dock just a few steps away) a stunning property where each of the 292 rooms offer a Persian Gulf view from the balcony and no less than 50 sq metres of living space. 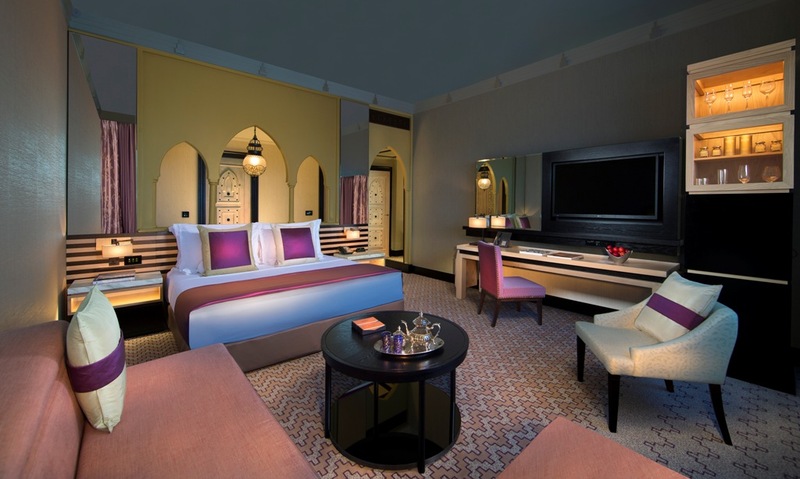 Exquisitely furnished in traditional Arabic style you get the feeling here that the attention to detail is meticulous. Everything from the crisp Egyptian bed linen to the marble encrusted bathroom and rain forest walk in shower, has been given the fine tooth comb treatment. 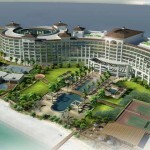 This was luxury living at its finest and a perfect example of just how well Jumeirah does hospitality. Downstairs, the huge lobby lounge is a perfect place to sip a drink and people watch while you contemplate just what to do next. Of course, if you are in one of the Executive rooms you also get to use the Executive lounge and sample some happy hour drinks and canapes or enjoy a more private breakfast experience if the mood takes you. You also qualify for a free limousine transfer to and from the airport. 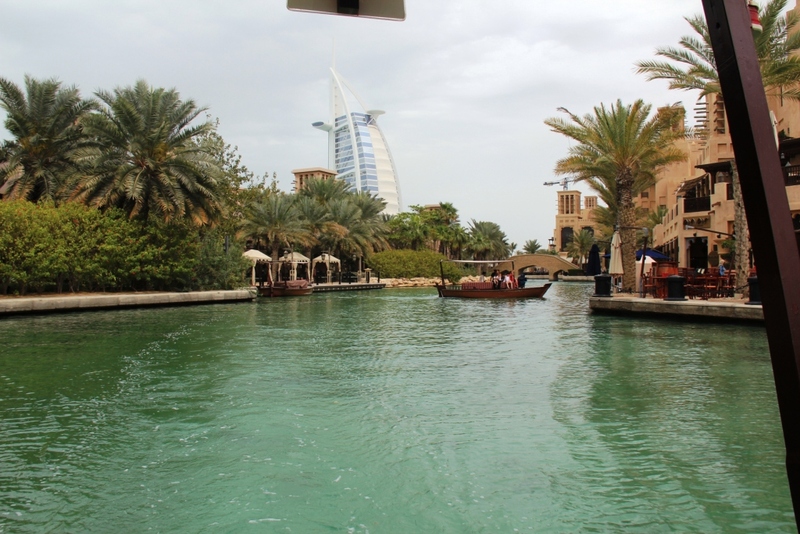 And after all this if you feel the need to explore the city, Madinat Jumeirah is just a 5 minute taxi ride to the Mall of Emirates shopping complex, a modern day souk perhaps? The Madinat Jumeirah offers the perfect luxury Dubai holiday experience with the convenience of everything in one place. The only thing I could think of that was better was another smoke filled whiskey cocktail, after all it was “as good as it gets” and I really couldn’t disagree with the sentiment. 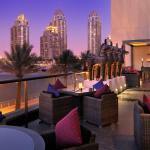 I want to stay at Madinat Jumeirah. How much will it cost? Executive Ocean Room at Mina A’ Salam from £692 per night.